Great for a simple lunch or healthy snack, these stuffed avocados come together swiftly and are loaded with Tex-Mex flavour! Cumin and fresh veggies keep the avocados healthy and super tasty. Avocados are not something I am fond of eating on their own. But add some texture and Mexican fair and I love them! Despite my daughter’s recent addiction to garlic salt on her morning toast, I found enough of it to shake on my stuffed avocado creation–and was it ever good! Lightly coat the cut green surface of the avocado with lemon or lime juice to keep fresh. Sprinkle with sea salt or garlic salt. Mix together black beans, mayonnaise (if using), and taco seasoning or cumin and salt to taste. 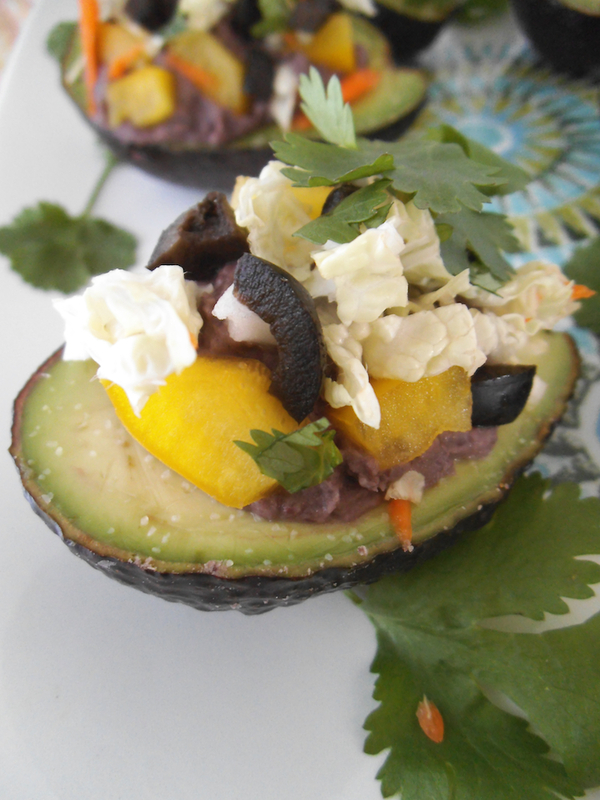 Fill each half of the avocado with a heaping spoonful of seasoned black beans. Top beans with sweet pepper, cabbage, and olives, onions, and cilantro (if using). 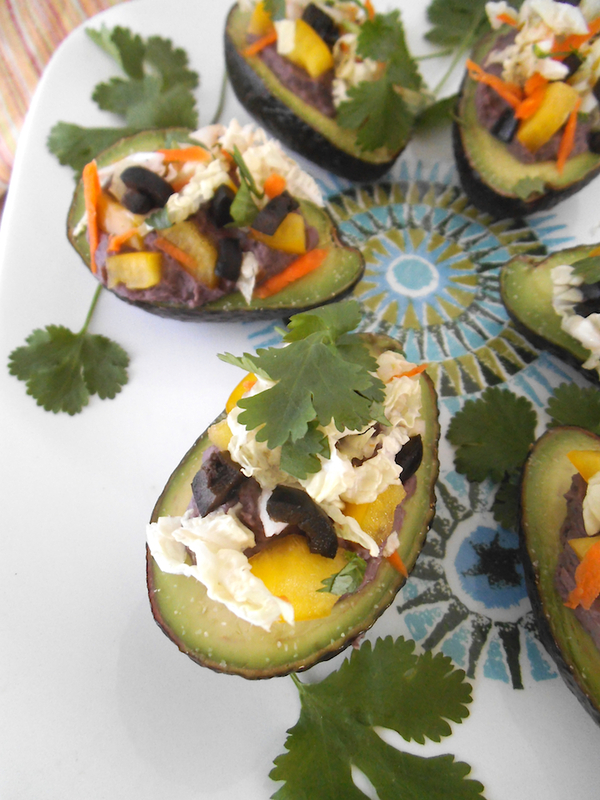 I am bringing these avocados to Fiesta Friday this week and sharing them here. Also shared at Allergy Free Wednesday , Gluten Free Wednesdays, and Savoring Saturdays. Yum! Looks delicious and like such an easy lunch! How about Greek yogurt as a replacement for the mayo? I think that would work fine. I prefer the higher fat yogurt for richer flavour. You might want to sweeten plain yogurt a tad with a little maple syrup so that it’s more like sour cream. Yes, the colours and the crisp vegetables are what I really like about these avocados! Thanks! And yes, there are so many possibilities for what to put inside. Have a lovely weekend! Thanks, Jhuls! A Happy Fiesta Friday to you as well! I love avocados, and yours look stunning! Thank you for sharing them at Fiesta Friday, to inspire us all!! 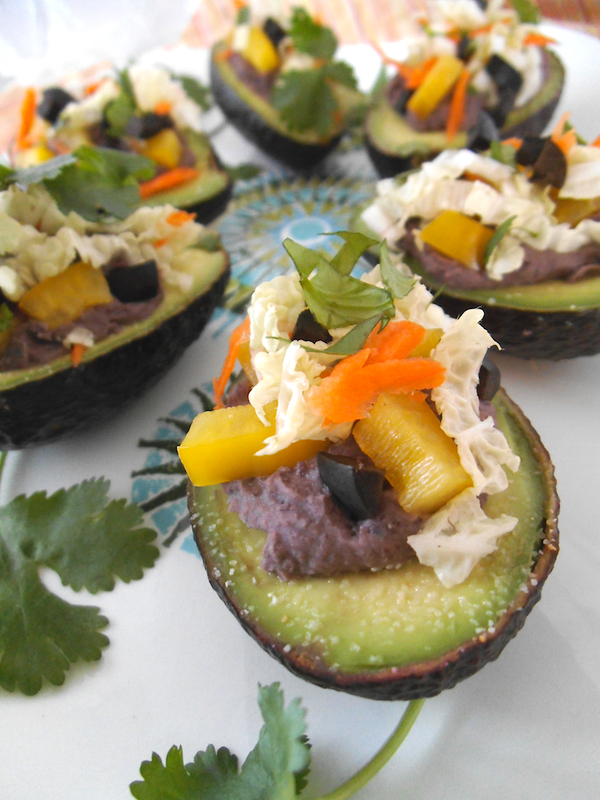 Black beans and avocados – a match made in heaven! Thanks! I enjoyed them for lunch twice last week. My son loved them too. Wow! Thanks so much for sharing this at Savoring Saturdays. 🙂 I’m going to feature them this weekend. I loooove avocado! All the flavors of your recipe are right on target;) Just had a grain-free lunch consisting of left-over beef, avocado with olive oil/hot sauce, on a bed of lettuce. Also, I had sweet potato chips and a smoothie! Hope you check out my blog for other creative combos..
I’m so glad you’re enjoying the recipes. 🙂 I’ll be stopping by your blog soon!